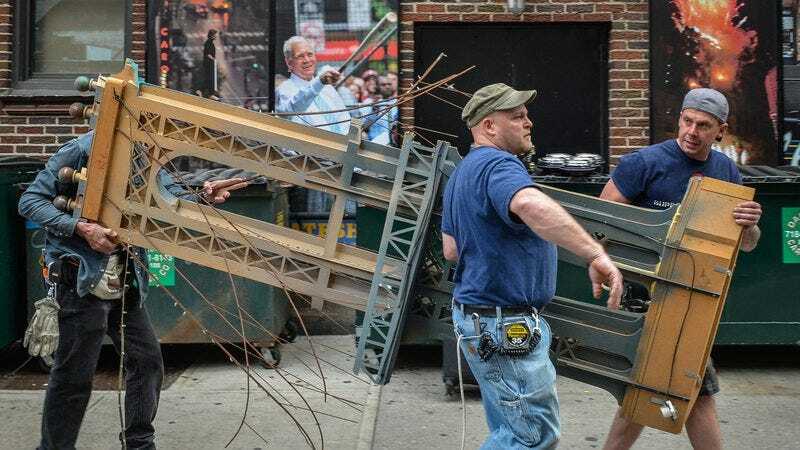 In an act that would actually be a pretty hilarious stunt if Dave Letterman was the person pulling it off, CBS construction crews have already begun tearing apart the set of The Late Show With David Letterman and throwing it in a dumpster. Workers outside the Ed Sullivan Theater were seen on Thursday, less than a day after the program’s finale, dismantling the various bridges that have long served as a backdrop for Letterman’s conversations with the world. Along with seats from the theater and other portions of the set, the workers quickly disassembled the bridges, cutting them apart in the street with saws and then hurling them away like so many comically discarded birthday cakes falling from a five-story tower. Out of all the faux bridges, only the replica of the George Washington, the most prominent part of Letterman’s background tableaux, is being intentionally saved for posterity. However, as reported in the New York Post, various onlookers were quick to salvage discarded pieces of the other destroyed bridges. It’s unclear whether the famously acerbic Letterman would be touched by that show of sentimentality for his now-discarded stomping grounds, or if he’d grinningly agree with the stagehand who told the Post’s reporter, “It’s all junk now,” as he resolutely carted it to the trash.